The Church of St Canice was built on the Roe Mill road site in 1783 but fell into disrepair after the new chapel of St Mary's was built on Irish Green Street in the years between 1836 and 1838. Some Catholic families continued to use the old graveyard well into the twentieth century. The wall surrounding the graveyard was erected in 1883. A fund had been established for the construction of the wall to which Michael King of Strangemore, Dungiven contributed the handsome sum of 28 pounds, 13 shillngs and 10d (Derry Journal 12 September 1883). The earliest headstone appears to have been that dedicated to the O'Neill family in memory of their daughter Mary (this headstone is no longer legible). "As a tribute of parental affection this stone was placed here to the memory of a dutiful daughter Mary O'Neill who departed this life 18th June 1810 in the 20th year of her age." 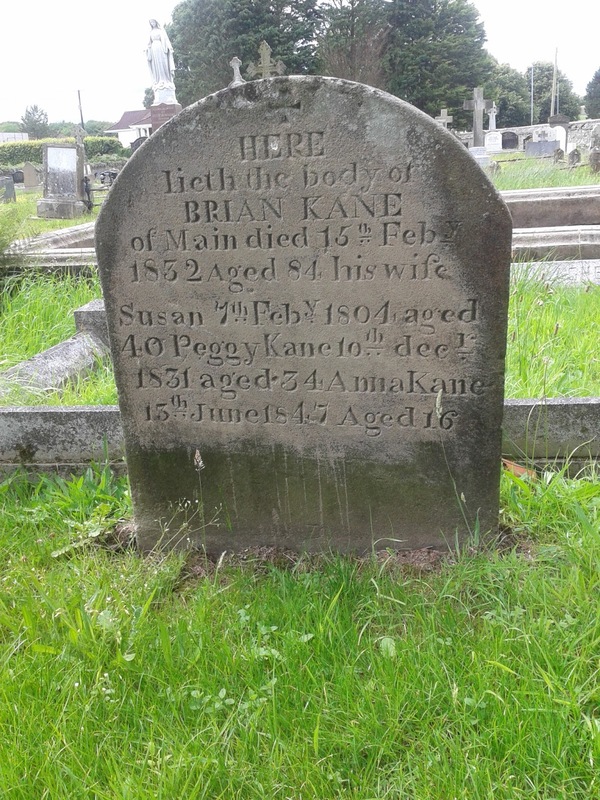 "Here lieth the body of Brian Kane of Main who died 15th February 1832 aged 84 years." This gives Brian Kane of Maine an approximate lifespan of circa 1748-1832. I have completed a survey of all the headstones in the graveyard as well as tracking down transcriptions that were made at various times to build up a comprehensive database of all pre-1900 headstones in the cemetery. In addition I have photographed the stones that are still legible such as the Kane gravestone above.